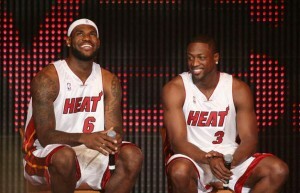 How Much is the Miami Heat Paying for their Top 3? The Miami Heat is currently in a battle with the Dallas Mavericks for the 2011 NBA Championship Title. Anyone who has watched Miami play can see that they depend heavily on their big three Lebron James, Chris Bosh and Dwayne Wade. So I was wondering how much are they paying these guys. Here is what each of them are being paid for this Season. Lebron – $14,500,000, Chris – $14,500,000 and Dwayne $14,200,000. I have not seen the bonus amounts for winning the NBA title but if they win I am sure that there will be some bonus involved.